Summary: We report a rare case of agenesis of the left internal carotid artery (ICA) and an aortic arch anomaly that presented with ipsilateral congenital Horner’s syndrome. Digital subtraction angiography revealed left ICA agenesis shortly after its origin and anastomosis between the left maxillary artery and the supraclinoid segment of the left ICA. Aortography of the aortic arch revealed the right subclavian artery arising as the first branch of a left aortic arch, followed by a bicarotid trunk and a left subclavian artery. High resolution CT of the skull base revealed the absence of the left carotid channel, consistent with congenital agenesis of the ICA. Unilateral agenesis of the internal carotid artery (ICA) is an extremely rare developmental anomaly (1–3). The absence of an ICA was first described in 1787 after being discovered during a postmortem examination (1, 4). When a unilateral ICA is absent, collateral circulation is sufficient to maintain cerebral function with few or no neurologic symptoms (3, 5). Most patients with ICA agenesis present with focal neurologic signs, such as convulsions, headache, or transient ischemic attack, and ICA agenesis may be associated with aneurysm, hemorrhage, cerebral hypoplasia, hemangioma, or anomalous vascular anastomosis (2, 5–7). Rarely, it presents with congenital Horner’s syndrome (8). In our review of the literature, we found only one case of ICA agenesis presenting with congenital Horner’s syndrome (8). ICA agenesis with aortic arch anomaly presenting with Horner’s syndrome has not been previously reported. This article describes a rare case of congenital Horner’s syndrome with left ICA agenesis and a rare aortic arch anomaly in which the origin of the right subclavian artery (SA) was the first branch of a left aortic arc, followed by a bicarotid trunk and the left SA. A 13-year-old female patient was admitted to our hospital for evaluation of depressed left eyelid and pupils of unequal size. Her mother had noted ptosis and unequal pupils shortly after birth. The left pupil diameter was smaller than the right. Several months later, a sunken left eye and a difference in the color of the irises occurred. The left iris was lighter in color than the right. There was no anhydrosis. Delivery and neonatal history were normal. There was no family history of any similar disorder. A neuro-ophtalmologic examination revealed 2 mm of ptosis, miosis, enophtalmos, and hypochromia iridis on the left side (Fig 1). The diameters of the pupils were 3 mm on the right and 2 mm on the left in bright light and 5 mm on the right and 4 mm on the left under indoor illumination. Pupils were equally responsive to light and near stimuli. Visual acuity was 20/20 in both eyes. Extraocular movements were normal. Sweating was tested by infrared heat applied with a lamp on both sides of the patient’s face. The sweating was the same on each side of the face. Hydroxyamphetamine test was not performed, because it was not available at the pharmacies or markets in our country. Photograph of a 13-year-old female patient with congenital Horner’s syndrome. Prominent ptosis, miosis, and iris hypopigmentation of the left eye can be seen. Complete blood count, sedimentation rate, serum chemistries, and results of radiography of the chest and cervicothoracic spine were all within normal limits. MR imaging of brain revealed absence of a complete left ICA. Digital subtraction angiography of the left common carotid artery revealed absence of the left ICA shortly after its origin and an enlarged external carotid artery, which presented an abnormal tangle of collateral vessels derived from the left maxillary artery. This collateral circulation was connected to the intracranial arteries by means of an abnormal tangle of vessels through the skull base and supplied the supraclinoid segment of the left ICA and middle cerebral artery (Fig 2A and B). The left pericallosal segment of the anterior cerebral artery was supplied by the right side through the anterior communicating artery. The left A1 segment of anterior cerebral artery was also absent (Fig 2B). 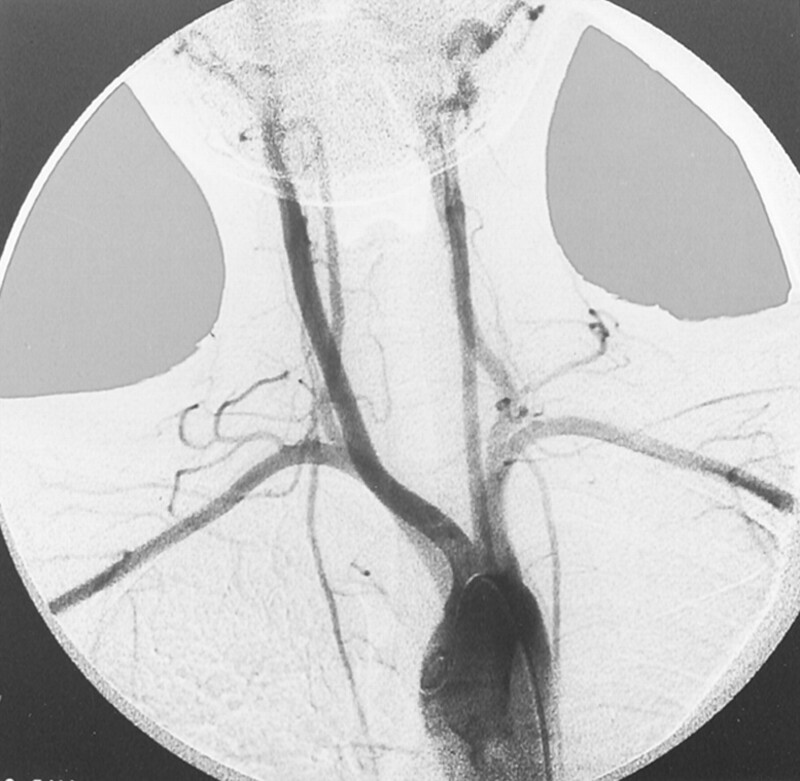 The left middle cerebral artery was mainly supplied from the basilar artery by the enlarged posterior communicating artery. The ophthalmic artery also derived from the maxillary artery. High resolution CT of the skull base revealed the absence of the left carotid channel, consistent with congenital agenesis of the left ICA (Fig 3). In addition, aortography of the aortic arch revealed the right SA arising as the first branch of the left aortic arch, followed by a bicarotid trunk and the left SA (Fig 4). Left common carotid artery lateral view and Towne injections reveal absence of left ICA (arrow) shortly after its origin and enlarged external carotid artery. A, Abnormal collateral vessels can be seen between the enlarged left maxillary artery and the supraclinoid segment of the left ICA (arrows). B, A1 segment of the left anterior cerebral artery is also absent. Right ICA was opacified via backflow from the left common carotid injection. High resolution CT scan of the skull base shows the absence of the left carotid channel. Carotid channel (arrow) on right side is normal in appearance. Aortogram of aortic arch reveals that the right SA is the first branch of the left aortic arch, followed by a bicarotid trunk and the left SA. Congenital absence of the ICA is a rare vascular anomaly. Only approximately 100 cases have been reported in the literature (2). The incidence of ICA agenesis is not exactly known. Lavaurs et al (9) reported two (0.33%) cases of ICA agenesis among 600 routine cerebral examinations. Among 826 cerebral angiograms obtained during last 7 years, we encountered only three (0.36%) that showed congenital agenesis of the ICA. Two of them had been previously reported (7). Agenesis of the ICA occurs before 24 days of embryogenesis (3-mm fetal stage), when the ICA is developed from the terminal segments of the dorsal aorta and third aortic arch arteries (2, 5, 8). The definitive common carotid artery and most of the definitive branches of the external carotid artery are present by 40 days of embryogenesis (16- to 18-mm fetal stage) (2). The carotid channel develops in association with the ICA. The skull base does not begin to form until the 5th to 6th weeks of fetal life. If the embryonic primordium of the ICA fails to develop early in embryonic life (before 3–5 embryonic weeks), the ICA and the carotid channel cannot develop (2, 5, 6, 10). Absence of both the ICA and the carotid channel in our patient was consistent with an insult having occurred before 3 to 5 weeks of fetal life. Three types of collateral circulation have been described as occurring in patients with unilateral or bilateral agenesis of the ICA (1, 10). The first is called the fetal type. With the fetal type, the anterior cerebral artery of the affected side is supplied by the normal contralateral ICA via the anterior communicating artery. The middle cerebral artery arises from the basilar artery through an enlarged posterior communicating artery. This type of collateral circulation is the most commonly encountered (1, 10, 11). In the present case, the anterior cerebral artery on the left side was also mainly supplied by the right anterior cerebral artery via the anterior communicating artery and the middle cerebral artery was supplied by the basilar artery via the posterior communicating artery. The second type is called the adult type. With the adult type, both the anterior cerebral and middle cerebral arteries are supplied via the anterior communicating artery (1). With the third type, which is the rarest, transcranial anostomosis may develop from the external carotid system, from the contralateral ICA, or from the primitive vessels (1, 2, 10, 11). In the present case, cervical, petrous, and cavernous segments of left ICA were absent and the supraclinoid segment of the left ICA was supplied by the primitive transmaxillary arterial anastomosis (Fig 2A and B). Most of the patients with ICA were asymptomatic because of developed collateral circulation (7, 10, 11). Common symptoms and signs include recurrent headache, blurring vision, hearing loss, hemiparesis with or without cranial nerve palsy, and intracranial hemorrhage due to ruptured aneurysms (2, 5, 8, 10). Absence of the ICA is associated with 25% to 34% of aneurysm formation on the circle of Willis (2, 5). The other rare reported pathologic abnormalities associated with ICA agenesis are corpus callosum agenesis, neurofibromatosis, meningocele, coarctation of aorta, and cardiac anomalies (3, 5, 6, 12). Congenital Horner’s syndrome is an uncommon disorder. It is often caused by damage to the lower brachial plexus and cervical sympathetic chain during a difficult delivery (13, 14). Other reported causes include congenital varicella, cervical lymph node compression, carotid artery thrombosis, ganglioneuroma, neuroblastoma, and congenital cytomegalovirus infection (8, 13). Congenital Horner’s syndrome also may be hereditary (13). The syndrome results from interruption of the sympathetic nerve to the eye, upper lid, and facial glands at any point in its course (14). The sympathetic fibers that innervate the forehead follow the external carotid artery (15). Furthermore, a sympathetic defect distal to the external carotid bifurcation produces ptosis and miosis without anhidrosis (as in our patient) (14, 15). The normal formation of melanin within iris stroma is dependent on an intact sympathetic innervation during early development. Congenital absence of the sympathetic innervation would result in hypopigmentation of the normal iris structures (16). In our patient, the presence of left side ptosis, miosis, enophtalmous, iris hypochromia without anhydrosis was consistent with interruption of the sympathetic pathway around the ICA within the first months of life. In our review of the literature, we found only one case of ICA agenesis presenting with Horner’s syndrome. Ryan et al (8) described a 30-year-old man who presented with migraine headache, transient visual obscuration, and congenital Horner’s syndrome. 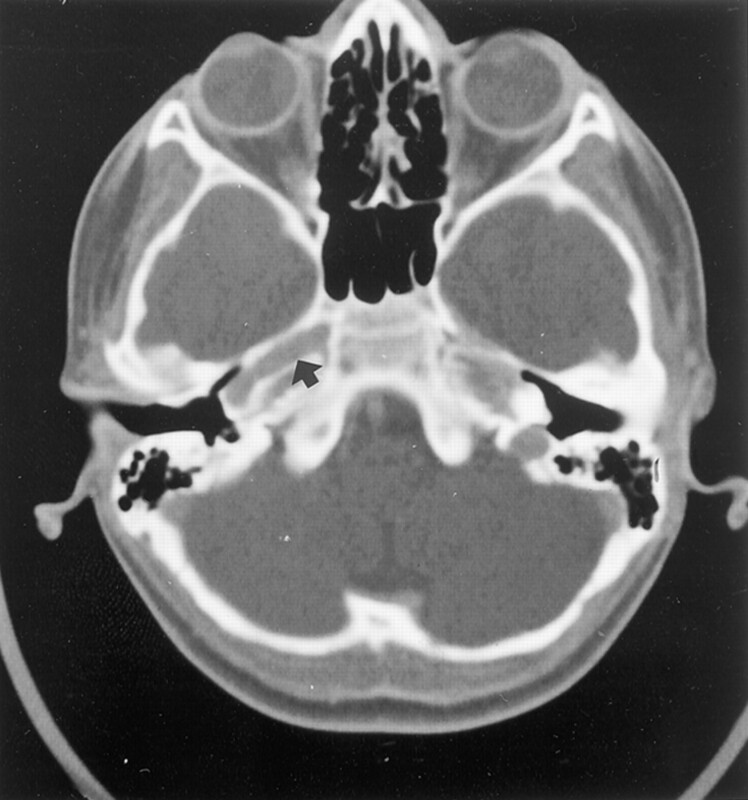 The patient had a lesion of the third order neuron of the oculosympathetic pathways (8). In contrast to the previously reported case, our patient had ICA agenesis with a rare aortic arch anomaly, with the right SA arising as the first branch of a left aortic arch, followed by a bicarotid trunk, presenting with Horner’s syndrome. This has not been previously reported. Although approximately 100 cases of ICA agenesis have been reported, only one case of ICA agenesis presenting with congenital Horner’s syndrome has been reported (2, 8). This suggests that in patients with ICA agenesis, the development of sympathetic fibers generally is not disturbed and the fibers have different routes during fetal development (8). Although variations in the number and arrangement of the great vessels of the aortic arch are not rare, the origin of the SA artery as the first branch of an aortic arch is extremely uncommon. Few cases have been reported (17, 18). Boechat et al (17), in their literature review, found only four cases of left aortic arch anomaly in which the origin of the right SA preceded the origin of a combined common carotid trunk and the left SA. They also reported similar cases of two additional patients. One of their cases had a right SA arising as the first branch of a left aortic arch followed by a bicarotid trunk and the left SA. In the second case, a right aortic arch was shown in which the left SA was the first brachiocephalic vessel, followed by a bicarotid trunk and a right SA (17). The embryologic origin of the SA may be explained by persistence of the fifth branchial arch with regression of the ipsilateral fourth branchial arch plus a segment of the dorsal aorta between the third and fifth arches during development. With cephalic migration of the seventh intersegmental artery, the future SA would arise from the fifth and not the fourth arch (18). Agenesis of the ICA may rarely present with congenital Horner’s syndrome and may also rarely be associated with aortic arch anomaly. Accepted after revision March 5, 2002.